The University of Rhode Island Student Senate had a lengthy meeting Wednesday to make the Senate Student Organization Advisory Review Committee’s Re-Recognition of student organizations official. Re-recognition is the process that heavily revolves around organization funding. There are categories such as funded, unfunded, unfunded affiliate, or funded affiliate relating to their activities and student membership. The most heavily debated student organization of the evening was the Student Organization Leadership Consultants, SOLC, which was previously determined to be an “unfunded group” in last week’s meeting though it had received funding in prior semesters. 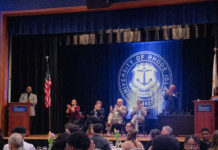 The SOLC is an affiliate of the URI Student Senate who works to promote and use peer leadership to help URI’s student groups effectively achieve their goals. They center their work around planning and facilitating retreats and workshops for student organizations. All in all, there were three separate motions made for SOLC, one to make them a funded organization, one to make them a funded affiliate and the final motion to make them an unfunded organization. The final motion was made by Senator Sam Lawrence, which led to a Committee Representative 3-5 vote, making it a hostile motion. A hostile motion requires a vote by the entirety of the Senate, including time for debate. The debate lasted almost two hours, highlighting an issue of key importance to the Senate. The debate centered around their ties to the Center for Student Leadership Development (CSLD), which many of the senators pushing for their status to be unfunded argued constitutes them as an academic groups. Academic groups usually do not receive funding. SOARC Chairwoman Samantha King also didn’t believe that group was representative of the whole student body, noting that many of the retreat information given to the Senate by the SOLC showed the majority of groups being related to Greek Life organizations in nature. SOLC representatives responded by stating it’s up to the groups to schedule trips and that spots fill up quickly. They also noted that loyalty plays a huge factor in who schedules retreats, and many of the organizations keep coming back due to high satisfaction. This semester alone, they serviced 380 students. Senate President Cody Anderson saw no reason that they should be made unfunded. After much debate, the Senate voted Lawrence’s motion down 23-12 with four abstentions. The group will now remain a funded student affiliate. SOARC also introduced a group recognition bill earlier in the meeting for URI Herpetology Club. The group focuses on the study of reptiles and amphibians, discusses herpetology journals and general discussion on the topic. They have 22 current members, and Senate recognized the group as an unfunded student organization. Finance Chairman Ryan Buck said the bill concerning the payment of the new Memorial Union lounge furniture will be put on the floor next week.